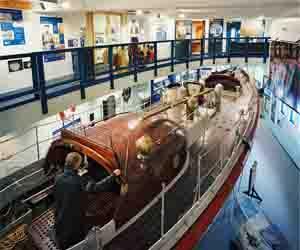 This family friendly museum tells the courageous history of saving lives at sea in Cromer. The first lifeboat was brought to Cromer in 1805 and the incredible volunteers have won 64 medals for their amazing efforts through the past 200 years. Henry Blogg served on the lifeboat for 53 years and is the most decorated RNLI crewmember. He was coxswain of the lifeboat H.F Bailey during World War II which is on display in the museum. There are also model lifeboats, Henry Blogg's impressive collection of medals, old movies, photographs and paintings as well as lots of hands on activities. We try to open on Bank Holiday Mondays but please phone to check before travelling. Admission is free. All donations are very much appreciated. A local authority car park on Cadogan Road charges 60p per hour and is a ten minute walk from the museum. From the car park head to your right down Cadogan Road, cross at the junction onto Hamilton road with follows onto Church Street. The third left hand turn is The Gangway. The museum is at the bottom of this steep hill on the right. There is a lift to avoid the steep descent. Disabled parking is available on the Promenade. Look at the sea and walk to right until you reach the museum. From Cromer Station. Walk to the pier, turn right and walk along the promenade to the museum.